Petal Talk: What are Your Favorite Garden Gloves? What are Your Favorite Garden Gloves? I don't know what I'll do without a good pair of waterproof gardening gloves this spring. My favorite brand, West County, is in the process of re-designing their waterproof model, but it won't be ready until mid-summer. Apparently, long-time users like me wrote to the company asking what happened to their wonderfully long-lasting waterproof gloves. My original pair lasted me three seasons, a major feat for gloves in my gardening arsenal! I bought a new pair last spring, and after using them a few times, carefully washed them. I even put them in one of those mesh bags and set the machine on delicate. When I took them out of the wash, most of inner finger fabric had disintegrated! The backs of the gloves look brand-new. West County work glove after washing. I spoke via email to representatives of West County, and they told me they will be selling out of the old waterproof model until the improved model is ready to be released, hopefully this summer. West County makes lovely gloves otherwise. For example, their all-purpose Work Glove is comfortable, fits well and is durable, even after several washings. 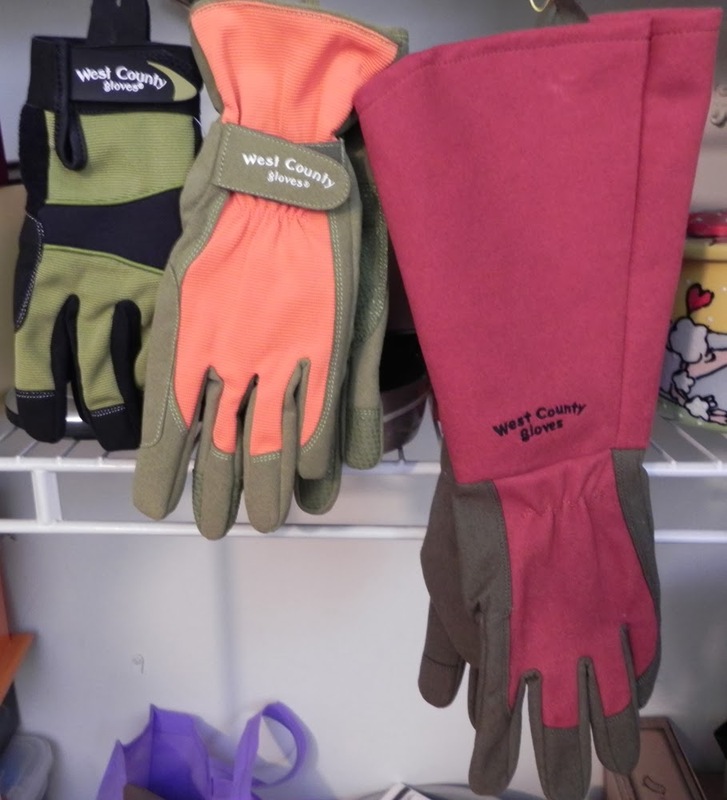 West County also has redesigned its work glove, adding some extra features and improving its fit. They have sent me a pair of the redesigned Work Glove, which I have hanging in my closet awaiting the great snow melt. Also hanging around waiting for spring is the Rose Glove, purportedly made with better fabric than its predecessor, which also had durability issues in their first wash in my machine. Gloves like these give me that wonderful unstoppable feeling--at least above the waist--required to blast through seriously thorny roses. West County also sent me a pair of the Classic model, designed with a cuff that looks like the perfect foil for dirt and other debris. I can't wait to try them, as debris can't wait to launch itself down into my gloves while I'm gardening. 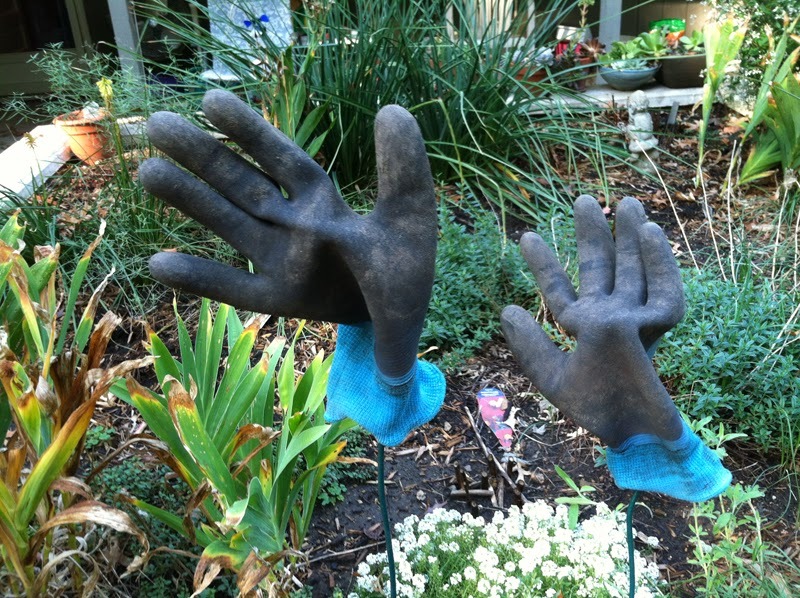 While I'm on the subject of gloves, I have also been using Woman's Work and Mud Gloves for the past couple of years, and I can recommend them for light gardening work. To me, calling the Woman's Work glove that I use the most a High Performance glove is fine if it means that it is long-lasting and durable. But when I'm about to do some serious digging, this is not the glove I reach for. The glove is great if you don't plan on shoving your hands into the dirt, but in my experience, planning isn't a priority when you're about to dig a hole for a new plant in an already over-filled garden. Don't get me wrong, as you can see from the photo, the Woman's Work High Performance glove has been well-used. It's just that one of the features that makes it comfortable for warm-weather use also makes it vulnerable to encroaching dirt. If I am about to get into a serious soil skirmish on a hot day, I am more likely to grab the Mud Glove, which is probably one of the best values in the glove world. For under $10 a pair, and often under $8, you can afford to have a few so that there will always be a pair at the ready. I'll have to research waterproof glove alternatives for spring. I need a pair that is flexible, durable, warm and at least water resistant. I hope that isn't too much to ask. If anyone has any suggestions or recommendations, I would really appreciate a comment. Thanks for your response! Until you mentioned them, I didn't realize Laura Ashley made garden gloves. I'll try to find them locally and possibly find out more about them.